kikimiqbalsoft - Jakarta-selling motorcycle lately flagging, various programs to attract consumers were prepared producers. Vespa, for example, Italian motorcycle manufacturer give a gift mini iPad 3G without raffled for every purchase of a motorcycle. 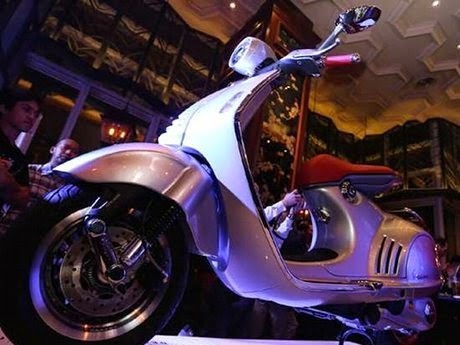 This promotion is given by authorized distributors Vespa and Piaggio in Jakarta and Borneo, Premier Vespa. In this promo period, Vespa purchase any type can get an Apple iPad Mini 3G wifi along with the data packets without raffled. Apart from the bundling promo Vespa with the iPad Mini, Premier Vespa also gives the other three promo options that can not be combined with other promos course. The third option other promos free Original Accessories (flyscreen for Vespa Primavera types, Sprint and GTS Super, front bumper for Vespa LXV type), Free 1 Year or All-Risk Insurance, or a piece of installment of one hundred thousand rupiah / month of CSfinance. "With the choice promo offered, free consumer choose benefits they are going to get according to their needs, " write Premier Vespa in a press release on Thursday (11/20/2014).